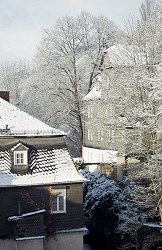 From 1999 to 2005 I lived with my wife in a small apartment in Marburg, situated in the Oberstadt at the Ritterstraße. The specific advantage of this place was that we had different views of the castle, the Altstadt, the Lutheran church, and other old buildings surrounding us. Because it was clear that the chance of having these permanent views in our daily lives would most likely never come again, the idea came up to use this chance to make a study of nine perspectives, over the five years, through all the seasons, with the accent on changing light. Eventually, I selected the best from more than 1000 slides and photographs to create a book. This was published in 2004 with a small print run of 50 copies, called Zauber des Lichts - Ansichten der Marburger Altstadt (Magic of Light - views of the Marburg Altstadt). The printed books were partly given to university libraries as a present, or to good friends. Here I present approximately half of the selection, with four photographs for each of the nine perspectives. Sorry, your browser does not support the IFRAME HTML tag, so you will not be able to view the slide show.